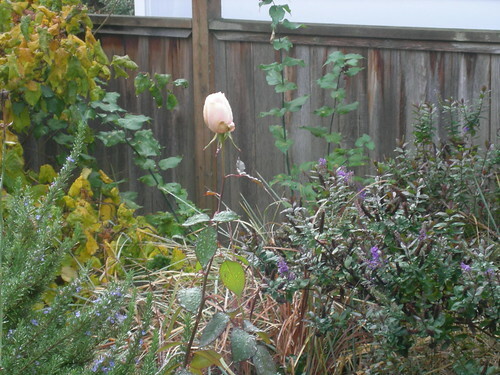 There’s a tradition among some of the Blotanical garden bloggers to post pictures of what’s blooming in their gardens on Tuesdays. I never seem to get around to it, although sometimes I at least take the pictures. So, one day late, here are some things that are still going strong, or at least surviving, as of October 7. 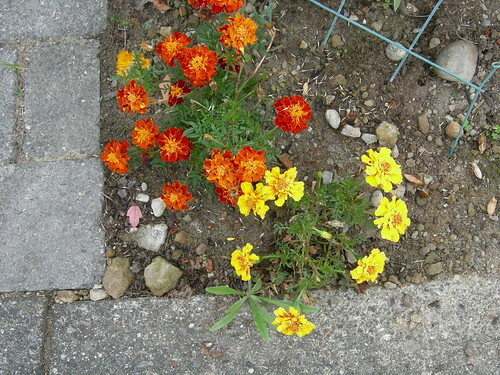 My mom grew these marigolds from seed and gave me them in early summer. I plunked them in at the corner of the parking strip, right on the street, forgot to water them, probably stepped on them a few times getting out of the car, but still they survived. I like to give them to friends who celebrate Dia de los Muertos at the end of the month, as there are usually a few left by then. 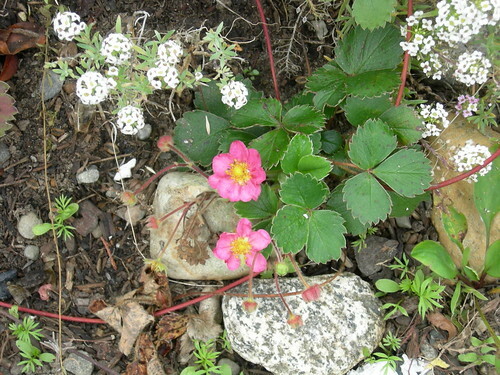 I’ve posted about these guys before, cute and prolific alyssum with its honey scent, and the steadily creeping and adorably named ‘Pink Panda’ ornamental strawberry. 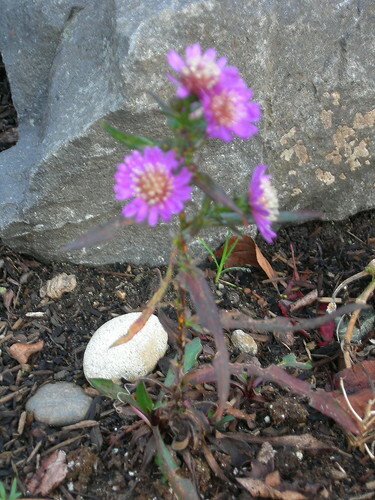 These ones live happily at the very edge of the parking strip, where it meets the sidewalk. No adverse affects from the occasional dog footprint, apparently. 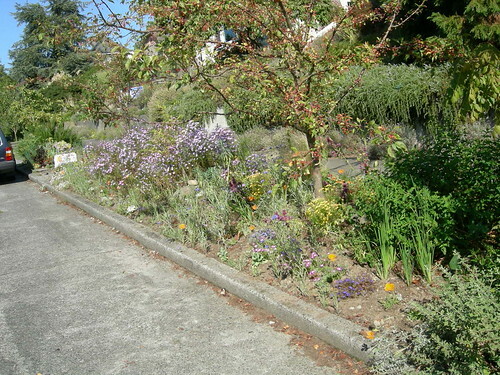 The previous gardener put in a million trailing rosemary plants to grow over and cover the boring cement retaining wall on the street. 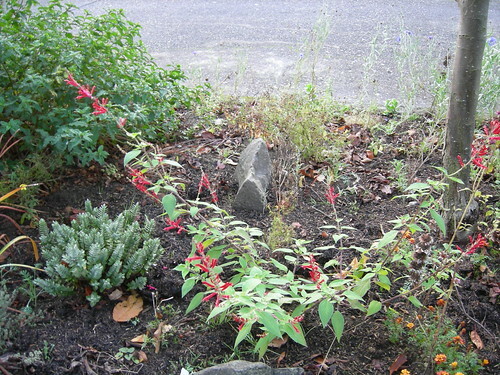 I’m so glad he did – the tiny, delicate leaves are gently fragrant, and it flowers twice per year, including in the late fall, providing nearly endless food for the bees. I’ve never watered it once in three years, so I think it’s pretty safe to say that it’s a water-wise plant once established. 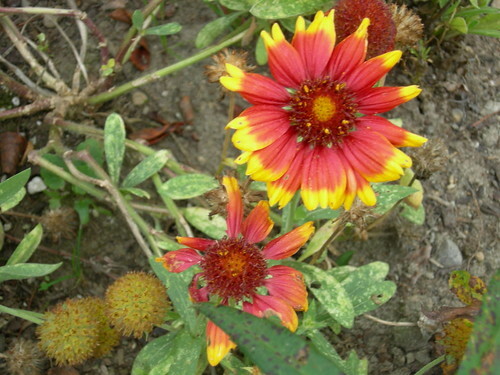 I planted blanket flower for the first time this year and didn’t take very good care of it, but it made it through the summer and is still blooming. I like how the seed heads look like little yellow pincushions. 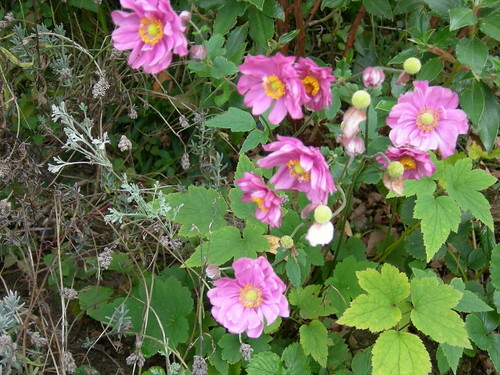 This pink windflower (Japanese anemone) took a year or so to get established and finally bloom. It’s not in the greatest site, but I see it every time I come and go from the front porch, and I’ve seen them massed in parking strips so I know they can take the extra punishment of a street garden. 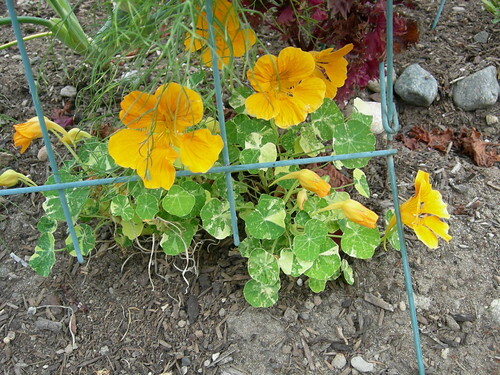 Hey, who put my variegated nasturtium in jail? That’s right on the street too, and I think a few car doors have hit the wire fence that encloses the veggie/herb patch, so it’s a little askew. 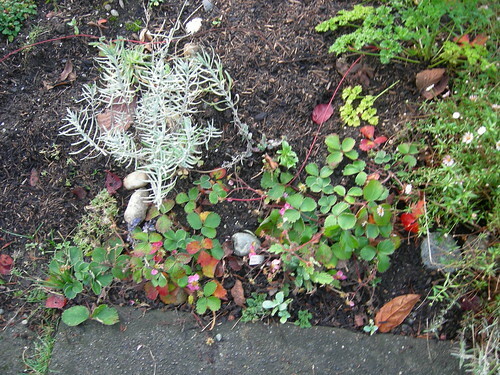 The feathery fennel and deep purple shiso leaves are visible as well. Finally, the California fuschia that is somehow managing to grow amidst the densely-packed cedar roots is still putting out a few last blooms for the hummingbirds to enjoy. 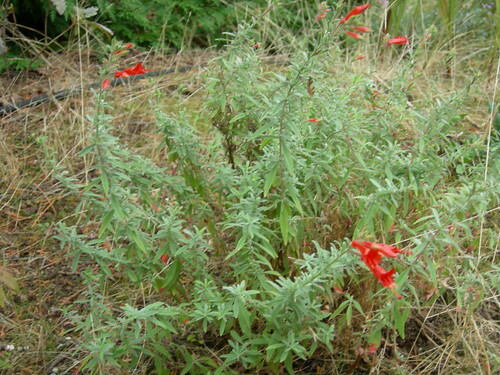 This would be a great plant for the parking strip, as it’s fairly tough and drought-tolerant. I love the silvery quality of its leaves. 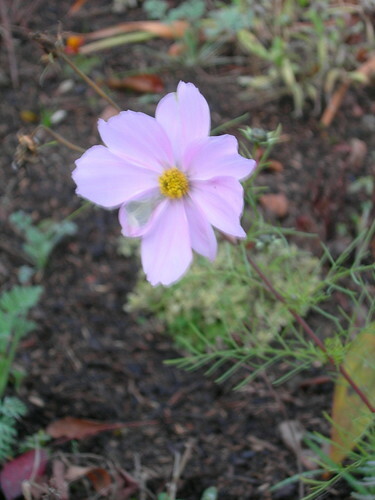 What about you, anything interesting still going on, flower-wise, in your garden? The previous gardener at my place got a couple of free crabapple trees from the city and planted them in the parking strip. These ones don’t have very showy flowers, their fruits are tiny and useless (the birds even seem to shun them), and their habit is spindly to say the least. They are really unimpressive trees and I am working up the energy to get an official permit to take them out and put in something better. Would you agree that they need to go? I know some people love crabapples, particularly their flowers. 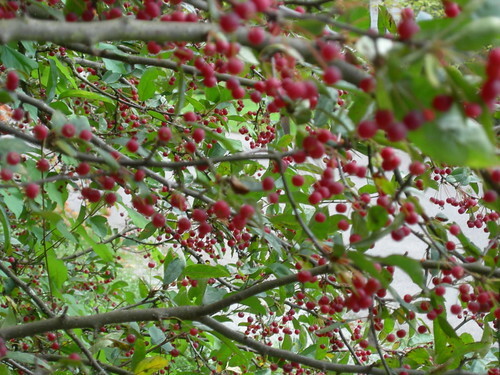 At the UW Arboretum the other weekend, I did see a nice, old Malus sargentii specimen covered with deep-red fall fruit, and I imagine its spring blossoms are spectacular. Although it’s a beauty, this tree has a low, spreading habit, so it’s not very practical for an urban gardener like me. Any votes for what trees to plant once the sad, spindly crabs are gone? It can’t be anything that gets too big, as we have a sliver of a mountain view from our front windows that we’d like to preserve. I’m also concerned about root issues, since I want to continue to plant drought-tolerant perennials and some annuals/veggies in that area. 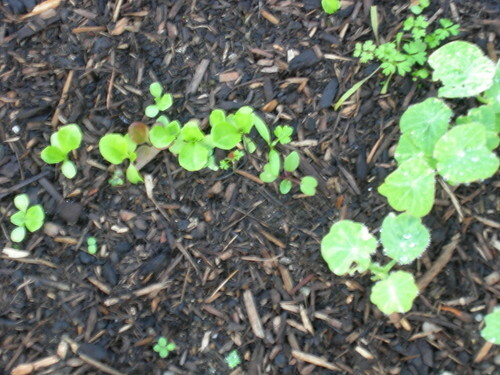 I seem to be one of the few folks who can’t figure out how to reliably grow nasturtiums. Every year, I either sprout the seeds or direct sow them, and nearly every year most of the plants fail. This year, some did okay, but others stayed miniscule, like this one. I should have put something in to show the scale, but it’s barely 3 inches across, as opposed to others from the same seed packet that grew to span nearly a foot with many showy orange or yellow blooms. 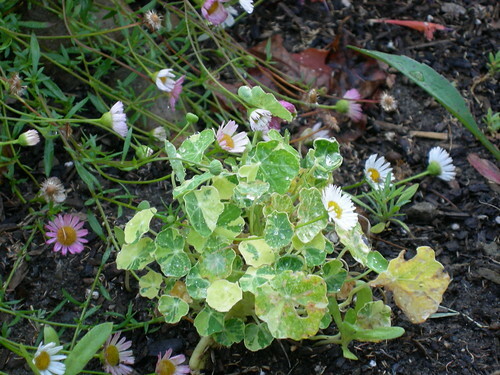 The tiny blossoms of the fleabane (Erigeron karvinskianus) visible in the photo give at least some idea – they are probably no more than 1/2 inch wide themselves. I have no problems growing that plant, it wants to take over the entire garden! 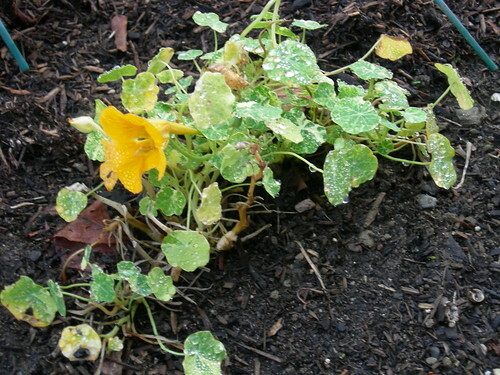 I’ve heard that nasturtiums don’t like too much water and don’t care if the soil is fair to poor, but that doesn’t explain my troubles – several were planted in the exact same bed but the results were completely different. 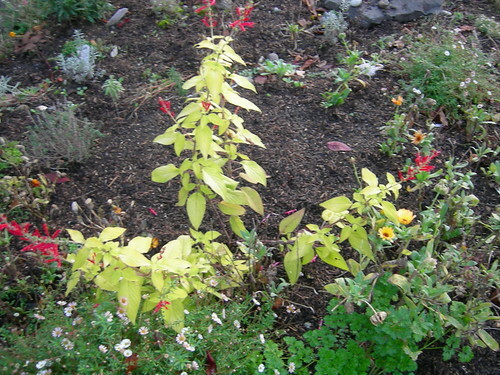 I liked the variegation concept initially but then, on the plants that looked less healthy, it was hard to tell from a distance which parts were light by design and which were just sickliness showing. I love this cheerful plant with its bright, edible flowers and rambling habit, but can’t seem to get it right. Does anyone have any hints? Late in the Seattle summer, as the garden is entering its final showy period before winding down, there are some flowers blooming out there that you just have to stop and sniff. The roses are doing their second bloom thing, a bit later than usual this year due to the cool/wet weather, the phlox is heady enough to practically knock you over, and in the parking strip, a few heliotrope are casting their sensual spell. This one looks like it’s getting a hug (friendly, I hope!) from its unidentified neighbor. 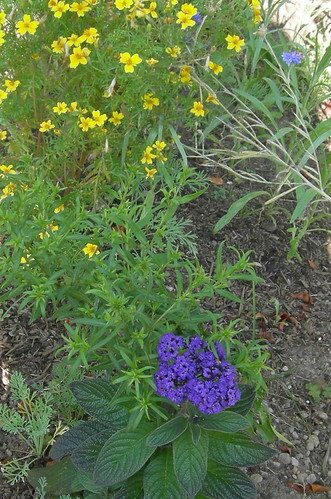 The ‘Lemon Gem’ marigold planted nearby smells pretty strong too, but more tangy and, well, lemony. Heliotrope is one of those old-fashioned annuals that I would probably never plant on my own, but my mom gives me some every year and they smell so amazing. 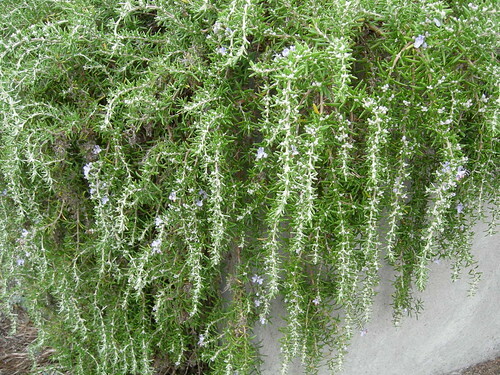 Here is an article about how to grow this scent-erific plant. How about you, what’s smelling (in a good way) up your garden at this time of year?